British historian, biographer and novelist, Ruth Brandon, has been making a habit of writing very good books on art and culture-related topics. Both fiction and non-fiction. She has written seven novels, primarily detective novels, including 2008’s fabulously good Caravaggio’s Angel (Constable). 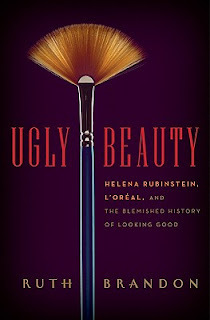 Her largest mark, however, has been with thoughtful works of non-fiction: a dozen books in all on topics as widely varied as a biographic look at governesses through the ages, a consideration of how the car altered modern life and, released just last month, Ugly Beauty, the story of the modern beauty industry, through the lens of Helena Rubinstein and L’Oréal’s Eugéne Schueller. It may seem odd -- certainly unexpected -- that a history of the beauty business should include an excursion into fascist politics. But cosmetics, unlike clothes, have always been a political hot potato. The stories of Helena Rubinstein and Eugéne Schueller show us why this has been so -- and continues to be so today. The Meaning of Life? 42!